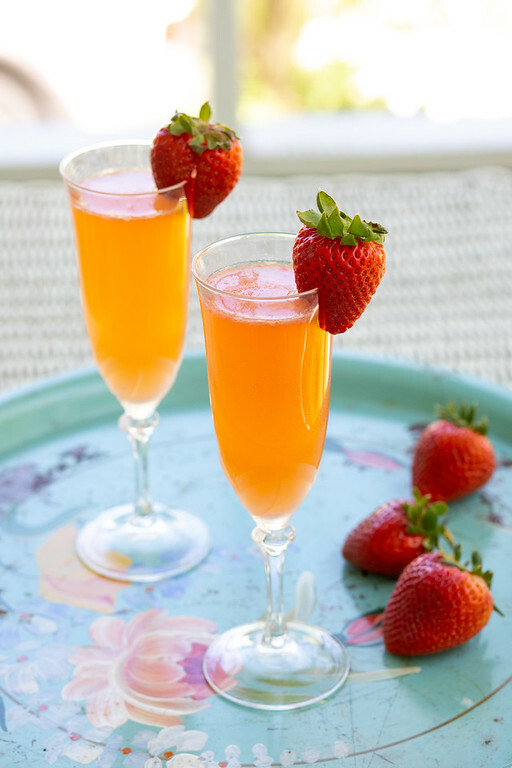 This Strawberry Ginger Bellini is a fun sparkling cocktail perfect for brunch or anytime! Sparkling rosé and strawberries create a pretty pink cocktail with a hint of ginger! Everyone loves this delicious cocktail! What to do With a Sparkling Rosé? We belong to a wine club and occasionally with our regular wines they include a sparkling wine. Pretty much the only time we drink sparkling wine is when we are out at brunch or it’s New Year’s Eve. We don’t sit around watching tv with a bit of the bubbly, like we do a nice bottle of red or white. Luckily for us, sparkling wines lend themselves to cocktails very well! Recently, we’ve loved the Classic French 75 and this Grapefruit Mimosa. Strawberries are a natural match for a sparkling rosé. Since my strawberries were Driscoll’s, I went to their site to look for cocktail ideas. They had a raspberry bellini that sounded good. With a few tweaks, I bring you this delicious Strawberry Ginger Bellini. 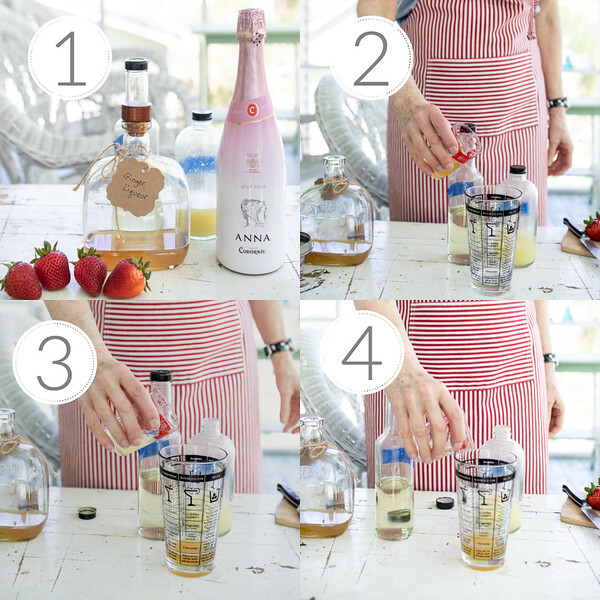 Let’s talk about how to make a Strawberry Bellini. It’s super easy, so I didn’t really need to take step by step photos. However, I was practicing using Wifi tethering to use my phone to view and take the photos. Let’s ignore the fact that I apparently don’t know what to do with my left hand while making cocktails. Step 1 – Gather your ingredients – ginger liqueur, sparkling rosé, lime juice, and simple syrup. Step 3 – Add lime juice to the cocktail shaker. Step 5 – Add two diced strawberries to the cocktail shaker. Step 6 – Add ice and shake vigorously for 15-20 seconds. Step 7 – Add 2 1/2 ounces of Sparkling Rosé to glass and pour the strained contents of the cocktail shaker into the glass. Alternately you could pour the contents of the shaker into the glass and top with rosé – that’s what I did with the second cocktail. Ginger liqueur can be very expensive, however you can make Homemade Ginger Liqueur for much, much less and it’s so easy! Keep a bottle of simple syrup in your fridge and you are always ready to make cocktails. Just mix equal parts sugar and water in a saucepan over medium heat, stir until sugar dissolves. Stored in the fridge, it will keep for about a month. Using this Ginger Simple Syrup would bring even more ginger flavor to the cocktail! If you don’t have ginger liqueur or ginger simple syrup, just add some diced fresh ginger with the strawberries to the cocktail shaker. If you want a stronger strawberry flavor, muddle the strawberries with the liqueur, simple syrup and lime juice before adding the ice to the cocktail shaker. This was so good. Not too sweet, just right. The strawberry and rosé pair beautifully together and the hint of ginger just makes it even better! Even though it looks like a girly cocktail, it’s not, my husband loved it! He kept talking about how smooth it was! This is the perfect brunch cocktail and it would be great for Mother’s Day, Easter or any day! See even more sparkling cocktails on my Sparkling Cocktails Pinterest Board! 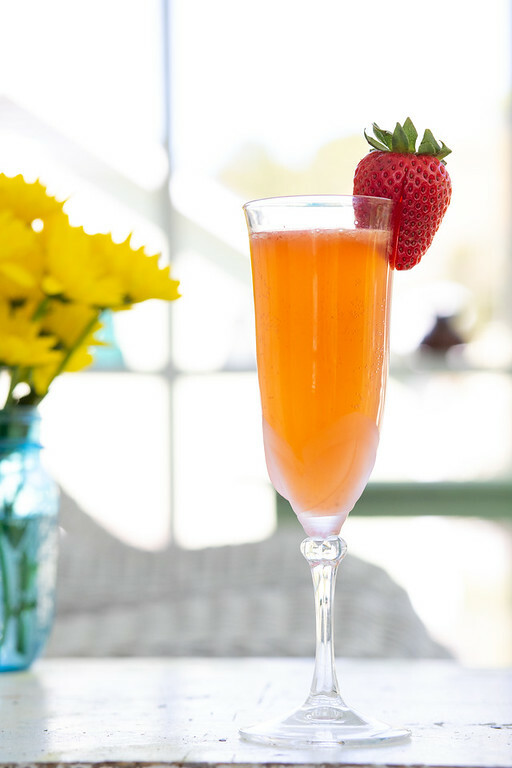 Get ready for the best summery bellini! Strawberries and ginger with sparkling rosé make a delicious cocktail that will become a favorite! Place ginger liqueur, lime juice, simple syrup and strawberries in a cocktail shaker. Add ice to shaker and shake vigorously for 15-20 seconds. Strain into a flute and top with sparkling rosé. Garnish with a strawberry. If you don't have ginger liqueur or ginger simple syrup, just add some diced fresh ginger with the strawberries to the cocktail shaker. To make simple syrup - heat equal parts of sugar and water in a small saucepan over medium heat, stirring to dissolve the sugar. Will keep refrigerated for up to a month. What a cool and refreshing drink for Easter brunch! Excited to try this out! Yes, it would be perfect for Easter brunch! Bellini’s used to be my JAM, but haven’t had one in quite some time. Love the use of strawberries and ginger, would be a perfect way to enjoy spring out on the patio. This strawberry ginger bellini will be a perfect brunch cocktail to have with my girlfriends. I love the addition of the ginger liqueur. The ginger really does make a difference! Love a good two-for-one recipe. I’ll definitely be making extra ginger liqueur for future cocktails! It’s one of my favorite liqueurs to make! 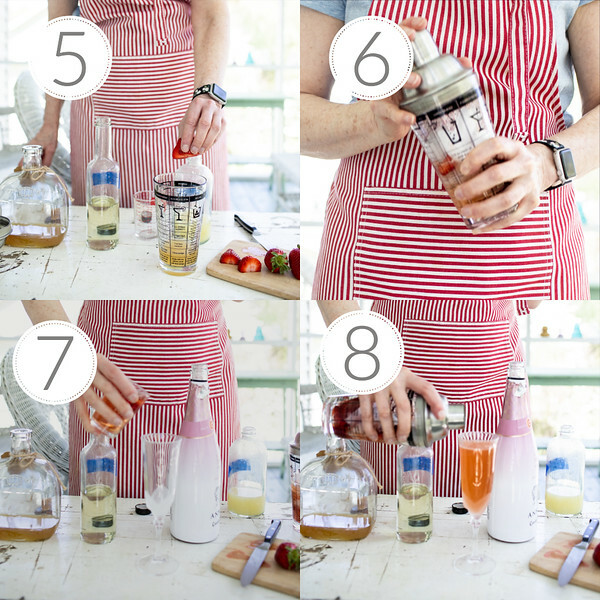 These Bellini’s look so refreshing and I love the combo of strawberry and ginger! I can’t wait to make these for our ladies brunch meeting. I will let you know how it went over. Thanks for saving my backside–I had no idea what I was bringing until this wonderful find. Oh great! You’ll have to let me know what everyone thinks!